The interchange went like this. A conservative MP asked the Prime Minister a Dorothy Dixer about how well the Government was handling the economy. here are three things that a country needs: a strong economy, strong defence, and strong, stable leadership. That is what our plans for Brexit and our plans for a stronger Britain will deliver. That is what the Conservative party will be offering at this election, and we will be out there fighting for every vote. The right hon. Member for Islington North (Jeremy Corbyn) would bankrupt our economy and weaken our defences and is simply not fit to lead. … The Prime Minister says that we have a stronger economy, yet she cannot explain why people’s wages are lower today than they were 10 years ago or why more households are in debt. Six million people are earning less than the living wage, child poverty is up, and pensioner poverty is up. Why are so many people getting poorer? Which were good questions and points and could have opened the door to a full-blown attack on mindless fiscal policy. PM: … I will be taking out to the country in this campaign a proud record of a Conservative Government: a stronger economy, with the deficit nearly two thirds down, a tax cut for 30 million people, with 4 million people taken out of income tax altogether, record levels of employment, and £1,250 more a year for pensioners. That is a record we can proud of. Corbyn: … They only eliminated the child poverty target, not child poverty. In 2010, they promised to eradicate the deficit by 2015. In 2015, they promised to eradicate the deficit by 2020. Austerity has failed, so does the Prime Minister know by which year the deficit will now be eradicated? … Only this year the new Chancellor pledged to eradicate the deficit by 2022. I admire Tory consistency: it is always five years in the future. Another Tory broken promise. The Prime Minister leads a Government who have increased national debt by £700 billion, more than every Labour Government in history put together. Debt has risen every year they have been in office. We know their economic plan was long term. Does she want to tell us how far into the long term it will be before we get the debt falling? The Labour leader then talked about that there was “less funding for schools and hospitals”, “tax giveaways to the richest corporations while our children’s schools are starved of the resources they need to educate our children for the future”, “For the first time in its history, NHS funding per patient will fall this year” and the like. … Is it not the truth that, over the last seven years, the Tories have broken every promise on living standards, the deficit, debt, the national health service and school funding? Why should anyone believe a word they say over the next seven weeks? Which would leave a person following this debate on TV, radio or in the press with the clear view that the Tories believe in government spending to enhance the outcomes from public services and have not been willing to cut into fiscal policy in case it would jeopardise those spending areas. Conversely, Jeremny Corbyn’s constant sniping that the deficit nor debt has come down only goes to reinforce it the public sphere that Labour thinks these things are important. Indeed, he accused the Prime Minister (in that exchange) of providing “tax giveaways to the richest corporations” in the same sentence as accusing the Tories of cutting school funding as if the juxtaposition was in some way valid – in a causal sense. In other words, if they corporations paid more taxes the government would have more funds to reallocate to schools. Again, reinforcing the claim the British government has to raise funds in order to spend and by giving ‘money’ to one group it has to take ‘money’ from another, which is really only true if the economy is operating at full resource capacity. Regular readers will be familiar with the following Table, which is taken from a paper that Dr Louisa Connors and myself wrote a few years ago and is to be published in the next edition of the Journal of Post Keynesian Economics. This particular version of the Table is taken from Chapter 8 of our forthcoming Modern Monetary Theory (MMT) textbook (Mitchell, Wray and Watts), which will cover the first two years of a macroeconomics undergraduate sequence and be published by Macmillan later this year. In our JPKE paper, we argued that the dominance of mainstream macroeconomics narrative in the public domain is achieved through a series of linked myths that are reinforced with strong metaphors. 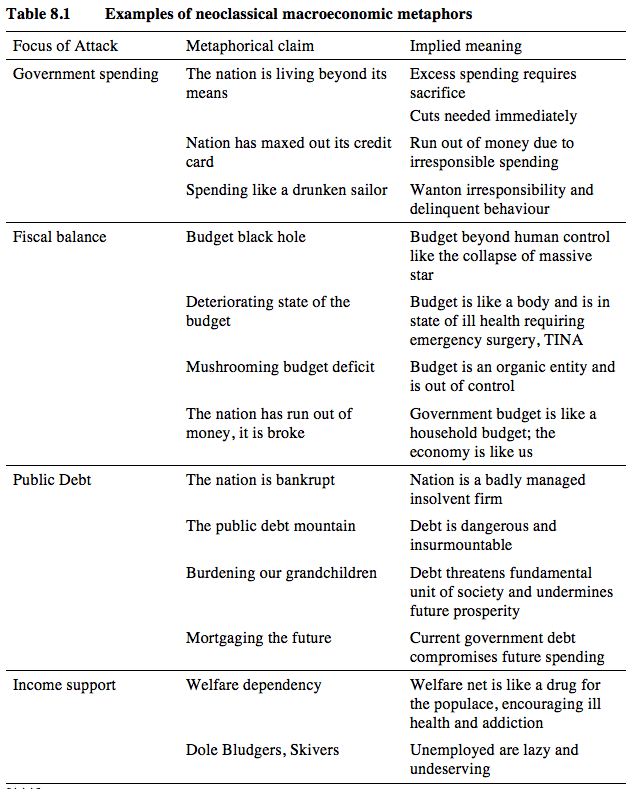 The following Table (Table 8.1) shows some of the popular examples of metaphors used by mainstream economists and commentators to focus their attack on government spending, deficits, public debt and income support payments for the most disadvantaged workers. Each of these metaphors is designed to reinforce the main core values that the mainstream (neo-liberal) paradigm seeks to promote, such as: self discipline; independence; ambition; wealth and sacrifice. Except, of course, when applied to the top-end-of-town, who continually put their hands out for government assistance in the form of lucrative contracts, favourable legislation, bailouts when their greed gets ahead of them and more. The point is that metaphorical claims obscure the truth and lead us to support policies that make us worse off even when there are alternatives that would make us all, in a collective sense, better off. If you think about Jeremy Corbyn’s attacks on the Government in the House of Commons on April 19, 2017 noted above, you will find they fit easily into this sort of metaphorical space. For our textbook, we have created an alternative MMT-flavoured Table, recognising that human cognition is heavily dependent on the use of metaphors and framing. Comparison of Table 8.2 with Table 8.1 will make clear how different the two approaches are. We can make use of our understanding of linguistics to provide a framing consistent with the policy space available to sovereign nations that issue their own currency. One would have thought that Jeremy Corbyn, a self-styled progressive leader would seek to situate his narrative and attacks on the Conservatives within this metaphorical space rather than play the game by the rules set by the neo-liberals and use the language they have crafted to advance their agenda. As the fact-checking site, Fact Check notes Corbyn’s claims that the government didn’t meet their deficit targets set in 2010 nor in 2015 are valid. It also notes the Prime Minister’s claims that the deficit has been cut by two-thirds are valid. The point is that Jeremy Corbyn should have been making in this interchange is that the targets set in 2010 were irresponsible and could never be achieved under the circumstances of the time. When railing against the Government and concluding that “austerity has failed” he should have pointed out that in the 2012 Fiscal statement (aka ‘the budget’), the Government reversed direction relative to its attempts in the first two years (after being elected in May 2010) to scorch the earth with its ideological austerity agenda. British growth was on the way to recovery, supported by the Labour deficit, when Cameron was elected. The following graph shows the quarterly real GDP growth rate from the June-quarter 2008 to the March-quarter 2017. After two years in office, Britain was heading back into recession, and George Osborne, changed fiscal strategies and increased government spending to provide a bulwark against the double-dip recession. He didn’t admit it openly but that is what happened. Thereafter, Britain began to post positive growth rates and has done ever since. 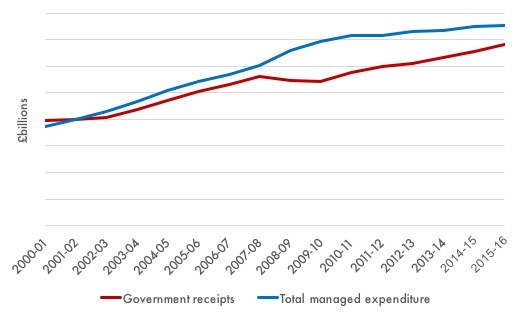 The following graph shows the movements public expenditure and receipts from 2000-01 to 2015-16. The two were growing in line up to the crisis, which makes the claim that the Labour Party were running huge deficits look stupid. The GFC had two consequences: (a) revenue fell as unemployment rose; (b) expenditure rose both because the automatic stabilisers were in operation (increased welfare payments) and because the government took the responsible decision to expand discretionary spending. George Obsborne inherited an economy that was growing again, with recover in revenue underway on the back of the growth. You can see what he did to spending. There was a brake put on nominal expenditure growth, which means that real expenditure fell in 2010-11. Then in 2012-13, he reversed course rather dramatically (a 2.2 per cent rise in spending) and allowed the fiscal deficit to rise from £78 billion to £87.5 billion in 2011-12. In 2011-12, he slashed the fiscal deficit from £100 billion to £77.6 billion, which is why the economy tanked again. That is what Jeremy Corbyn should have been emphasising. Not why haven’t they succeeded in cutting the deficit but why did they reduce the deficit and given the state of the British economy now, why aren’t they introducing even large fiscal stimulus policies. That would be the responsible message for a progressive Opposition leader to be pushing out. Not the neo-liberal mumbo jumbo that deficits are bad. The confusion in the Labour narrative is in the quoted sections above. Jeremy Corbyn talks about cuts in public spending and the increasing burden of household debt but doesn’t seem to be able to make the connection with the shrinking of the deficit by two-thirds. 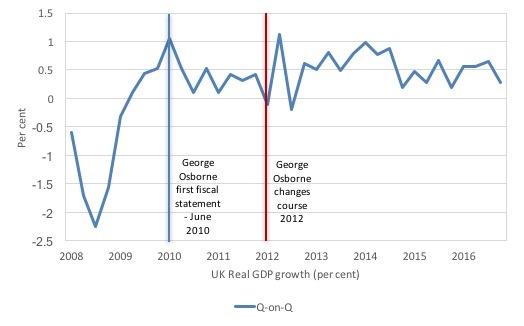 It is obvious that George Osborne set out to mask the damaging effects of his austerity push by relying on an export-led recovery (taking over from the fiscal stimulus supported recovery he inherited). He obviously thought that with the exchange rate falling the current account would adjust and inject net spending. Remember all the nonsense about the ‘March of the Makers’? Please read my blog – The March of the Makers – out! – for more discussion on this point. It soon became obvious that the external sector was not going to provide the support and he then relied on increasing indebtedness of the private domestic sector to save his hide. To some extent that has happened – as household debt has soared including non-mortgage debt. That is a disaster waiting to happen. Why can’t Jeremy Corbyn make these links? Why can’t he see that if the Government had have kept their early promises about the deficit that the plight of the economy would be much worse than it is now, and, many more households would have lost their homes and entered bankruptcy. Why can’t he see that if the government squeezes the non-government sector with fiscal deficit reduction and income growth is flat, then the household sector must increase debt to maintain consumption spending? These are simple sectoral balance propositions, apparently lost on the message writers of British Labour. Sadly. 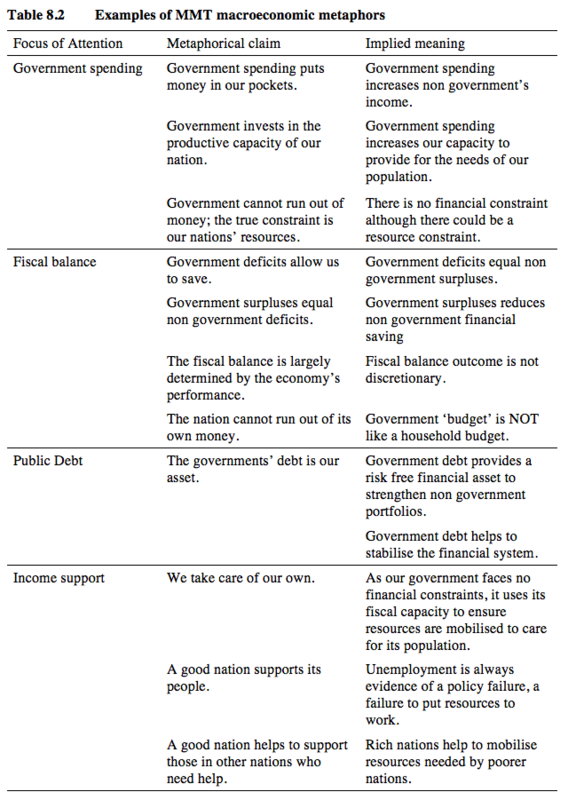 It would be of educational value to print the two Tables off (they are png format files) and put them on a flat surface next to each other and recite the neo-liberal claim and then immediately recite the MMT claim to help in deconditioning yourself (if you are still doubtful). Unfortunately it is too late to change the deeply ingrained myths that the Tories successfully belabour the poor brains of the populace with. The outcome of the election is clear: Union Jack waving, a power-dressed numpty repeating the mantra ‘strong and stable’ and references to Thatcher 2.0 and there you have it. It’s like living in a zombie move -don’t bother with the computer games we’ve got the real thing! I suspect we’ll have another decade at least of this stuff, now with an explicit one-party state in the UK. Corbyn could have AT LEAST challenged the bankruptcy meme, ffs, even Trump managed that! (http://edition.cnn.com/2016/05/09/politics/donald-trump-national-debt-strategy/) and even greenspan said the same (www.youtube.com/watch?v=jB0lcX-GtOU). So the libertarian/neo-lib camp can make this clear but the Left continually fails – woe, woe and thrice woe! Corbyn is reciting what McDonnell told him to recite, and McDonnell derives his ‘fiscal rule’ from the advice of the likes of Simon Wren-Lewis, Danny Blanchflower, James Meadway and the other neoliberal and static Marxist advisors he’s been talking to over the last two years. The crash and burn that is Labour on the economy is blood on their hands and they should be held accountable for their failure. McDonnell appears obsessed with clobbering the rich. He wants the quick death of the rich by taxation firing squad. I prefer imprisonment in purgatory – forcing the rich and their corporations to compete and earn their money in a world where labour always has an alternative job to go to. The English press are also frustratingly ignorant on this matter. Mazzucato was on Newsnight yesterday and the interviewer kent asking how much debt/deficit would be appropriate. After which Mazzucato trots out the debunking of Reinhart and Rogoff. To top it off we had Varoufakis making a case for voting neo-liberal Macron just to keep out the fascists. These times are quite unbelieveable. I suggest the nongovernment sector ie most likely making me poorer! Suppose that you were to spend a couple of hours with Corbyn and that you could convince him of MMT. He would also make you his regular economic adviser and talk to you at least once a week. Would that make him more electable? I doubt it. The Conservatives would portray him as an irresponsible spendthrift who would burden the country with debt, bring about inflation and rob posterity. Just as 2 centuries after Adam Smith most people still are mercantilists who think that exports are good, so the vast majority of the voters believe that governments are just as revenue-constrained as a household. In politics, an open commitment to MMT could be electoral suicide. On the other hand, if Labour can only win by becoming Conservatives B, then they may as well lose. Only eighteen months or so ago you were, Bill, singing Corbyn’s praises. At the time he had an Economic Advisory Panel including, if memory serves, Richard Murphy and Ann Pettifor, and was parading out the idea of QE for the People. All that has disappeared. Politicians are only interested in one thing – getting elected – and there are no votes in the idea of PQE because it is too difficult for the electorate to understand. Reducing the deficit and government borrowing, and taxing the rich are much more likely to attract votes because of the mindset of the electorate, so that has to be what he goes for. What he, and any other politician, does after being elected is entirely another matter as you demonstrate from your figures as to what Osborne did. Genuine progressive politicians must first understand MMT well enough so that they can clearly and simply explain what is wrong and damaging with the current paradigm and to have simple but credible defences against the inevitable attacks from the Conservatives. That’s not to deny the challenges involved of course but the alternative of becoming a variant of the Conservatives is just as untenable. Blairism demonstrated that. To add insult to injury, Diane Abbott (Shadow Home Secretary) promised, in an utterly cringeworthy radio interview yesterday, 10,000 new Metropolitan Police officers at a total cost of £80,000. “So that’s £8 each?” queried her interviewer, incredulously. After pausing and pontificating for an excruciating amount of time, she revised this to £300,000. (I suppose £30 is an improvement on £8). Apparently, she later upped it to the correct figure of £300,000,000, but I couldn’t bear the agony, and stopped listening well before that point. If all our hopes are vested in these utter incompetents, then we really might as well just give up. Jezza is still better than the Tories even if he and McDonnell have learned absolutely nothing. Wasn’t Richard Murphy advising them at one point ? I never thought he actually ‘got it’ either but he seems to be starting to judging by his blog today. Haven’t read it though so apologies if I’ve got the wrong end of the stick. Metaphor is a vector for getting from -here- to -there-. It takes an understanding we already hold and paints it onto the surface of something else, highlighting aspects that were otherwise hidden. Successful political campaigns take us from -here-, the current milieu, to -there-, whatever comes next. For opposition politicians to take on a more popular incumbent, they need to lead a majority of voters from the -here- they are currently comfortable with, to the -there- they are trying to sell us. This is hard. The strategy you have outlined for Corbyn, one where he forthrightly sets out to paint a picture of *how the world really works* is doomed. It’s the strategy taken by minority parties like the Australian Greens, because when you don’t have a hope of winning a majority of seats the only worthwhile platform is one that sells a vision of wholesale change to those who have already bought into the vision. Corbyn’s attack on government spending is just that – an attack by a nimble opportunist unencumbered by the support of a majority of voters, one attempting to chip off the weakest fish on the margins of the school milling around the incumbent leviathan. The only way he wins is by shattering the impression of conservative economic superiority, because that’s what prevents swinging voters swinging away. Austerity exists because voters think it is necessary. The equivalency between households and national accounts exists because it is a natural metaphor for politicians to use and abuse, and painting conservatives as incompetent bookeepers is the only current way of shaking off enough swinging fish. So maybe give him a little bit of slack. He’s not trying to be a minority party leader proudly waving his convictions like a battle flag. He’s trying to win an election. In the same vein, I believe your second table of metaphors do not successfully take us from -here- to -there-. They speak to people who have already been sold on your vision. We are already at least part way -there-. Everyone else will try to interpret them using frameworks they already know, and it’s inevitable that that will be ‘socialism’. For your metaphors to work, and for you not to have to fight an uphill battle against the loony leftist tag that is already applied to you, the metaphors need to start with the framework that currently exists, the one painted in neoliberal shades, slightly tweaked to tell your story. I clicked on Steven Watson above in some trepidation expecting to find some long diatribe about how MMT is palpable nonsense and, indeed, wondered why Bill had not deleted it. But not a bit of it. He clearly does understand MMT at least to my own inadequate level and probably well beyond. But he is also saying much more eloquently than I what I have been trying to put over. It is no good thinking that we are suddenly going to have a political party that embraces MMT and we are all saved. It isn’t going to happen that way because the vast majority of the population have no idea how the monetary system works and just assume that it must work the way the politicians say it does. After all, as I have said before and elsewhere, we all think of the sun as coming over the eastern horizon in the morning, travelling across the sky and disappearing in the west. EVEN THOUGH we know full well that that it does no such thing. We even less know how the economy works. Well most people that is – present company excepted. That is why, as I said above, Corbyn and McDonell have changed their tune. They are no longer talking about PQE because they know it won’t sell. So they’ve just got to go along with the crowd for now. The trouble is Corbyn, I’m afraid, just hasn’t got the charisma. So they need to get their act together and hire a decent actor like Tony Blair (but not him, perish the thought) to install as the leader by 2022. May be too late by then I fear. So do have a look at what he is saying. And well done, Bill, for leaving the post in. Corbyn and the debate referred to illustrates very well the failure of the left to come up with their own economic programme and understanding. This is the biggest tragedy of our times. As someone above said, if they become neo-liberal Conservatives version B, they might as well not win. The change started with New Labour after Thatcher, and it went downhill ever since. In the UK and worldwide. There is no one to save us, folks… maybe just by mistake as some sort of post-Brexit economic stimulus, if it does not take the shape of more QE and more interest-rate reduction. I need to start asking people that. Where does the government surplus come from? YOOOUU!!! Two weeks after he won the first leadership election in Sep 15 he and McDonnell were talking about balancing the books. There was no hope they would ever attempt to reframe the arguments correctly – in my opinion it was because they knew they personally did not have the ability to explain it – they were intellectually incapable of making the argument, so they simply returned to their comfort zone. Its much easier, especially in light of the threat from the right of their own party never mind the opposition. Reframing I believe will take a whole parliament, probably two or even a generation – it can’t be done overnight nor in the four weeks before a general election. It would need a politician(s), most likely an economist, to enter parliament and build from there. The vast majority of MP’s simply do not have the knowledge nor confidence to pull it off. To echo Barri’s point, it’s a skill in itself to communicate the concept in a way that’s easy enough for the layman to understand, whose attention is naturally elsewhere for 99% of his existence. Additionally our hypothetical MMT politician has to have the intellectual clout to be able to browbeat any politician, economist or TV interrogator of a neoliberal persuasion. Those types of exchanges are perhaps unnecessarily gladiatorial and generate more heat than light. But the public generally respect a politician who can hold their own without resorting to sound bites and smack an opponent upside the head with a few truth bombs. Not easy to find and none I can think of in the HoC. To quote Sean Connery in the Untouchables ”If you’re afraid of getting a rotten apple, don’t go to the barrel. Get it off the tree.” I remember having a quick look at the bios of the 2015 intake of new MP’s, and I’ll probably do the same again in 4 weeks time. The debate really takes place inside the neoliberal framework and mantra which means their is no real debate at all! Within the so called free market, a clique of incredibly wealthy, well connected, and well organised individuals have decided to use their freedom to create “governments” they influence, media they control, police who impose by force their will upon populations, a military to either protect their racket or project it beyond their current areas of operation. No one is going to question any of the fundamental assertions of this new neo-thing they’re not going to question it. They’re going to go along with it. I think it will take an uprising (rioting in the streets by the plebs) or a complete economic collapse before there’ll be any meaningful change. Sorry. Labour may well be lost in a neo liberal haze but I would suggest that is not their main problem right at the moment. They just seem to have lost the political knack of fighting elections. Last election they seemed incapable of contesting the Tory narrative about the GFC. This time they are largely failing to hold the Tories to account for their dismal economic performance even in on its own terms. The ten percent fall in average wages hardly rates a mention. Nor does the dire productivity of the UK economy or the lack of investment. Corbyn is probably good enough. His personal values are sound unlike the Conservatives and he can handle parliament and a media interview on a good day. The shadow Chancellor of the Exchequer must however be a top level MMT economist and a strong debator and all core MMT positions must be Labour Party policy. McDonnell is on the right track regarding taxing the wealthy and the major corporations who currently have far too much latitude for avoiding paying their fair share of tax. A Buffet Rule tax would be good policy. Wealth redistribution without over doing it using taxation is essential even in an economy with the right amount of fiscal stimulus as Picketty showed that capital is a stronger wealth generator than employment and is the main driver for inequality. As the election is very soon and nearly all Labour MP’s are Blairite neo-liberals and given the ignorance of the electorate and appalling mass media, victory in the election is too much to ask for but continuing the progressive reform of the party, energising the grass roots, purging the party of neo-liberalism and embracing the power of MMT fiscal stimulus and a Job Guarantee should bring election victory within reach eventually. Theresa May and the Conservatives may also self destruct at some point. Rupert Murdoch may also expire ridding this world of its worst oligarch. As others have mentioned, chasing the swinging voter by continuing to be Conservative team B is pointless, dishonest and highly destructive for the party and especially for the people of the UK.